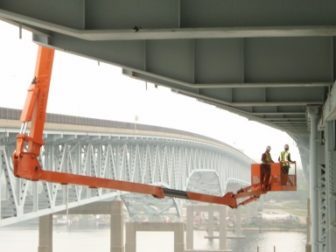 Workers inspect the Gold Star bridge carrying I-95 across the Thames River between Groton and New London. Gov. Dannel P. Malloy will ask legislators this year to establish electronic tolling on Connecticut highways by mid-2022 and to phase in a seven-cent gasoline tax hike to not only avert insolvency in the transportation program but also fund a major, 30-year rebuilding initiative. 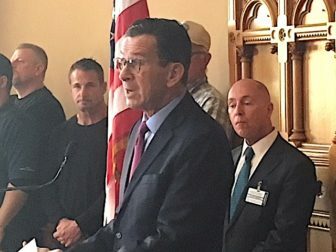 Malloy, who announced his plans Wednesday, will propose the final budget adjustments of his administration next week to the General Assembly. The governor, who declared last year he would not seek a third term, said these revenues would rescue not only an aging, clogged network but also an economy handicapped by an inadequate transportation infrastructure. What is at stake, he added, is not just a viable transportation system and healthy community, but also a vibrant economy. “It is about growing our economy today, tomorrow and far into the future,” he said. The governor’s plan would boost the state’s 25-cents-per-gallon, retail gasoline tax seven cents in four stages, starting with a two-cent hike in July. Connecticut would add another penny in July 2019, two cents more in mid-2020, and the final two cents in July 2021. The administration estimates electronic tolling could be implemented by the 2022-23 fiscal year. The governor’s proposal would authorize the state Department of Transportation to craft the details of a new tolling system, including the fees and the locations of electronic toll readers. But Malloy said Connecticut’s system certainly would be different that that of some other states, including that of a neighbor like Massachusetts. That’s because Connecticut’s highways have more entrance and exit ramps than the systems in many other states. Both Malloy and DOT Commissioner James Redeker said very preliminary estimates are that a tolling system, once fully implemented, would raise $600 million to $800 million per year, and that roughly 30 percent of those receipts would come from out-of-state motorists. Other components of the governor’s plan include establishing a $3 per tire fee on all tire purchases and accelerating the previously approved transfer of certain sales tax receipts from the General Fund to the Special Transportation Fund. On paper, the state’s transportation program, while not flourishing, is stable. According to projections released in late October by the legislature’s nonpartisan Office of Fiscal Analysis, the transportation fund will run in the black annually at least through 2022. But that forecast doesn’t assume any major expansion in capital projects, and officials from both parties acknowledge Connecticut has under-invested in transportation for decades. The state has roughly $3.7 billion in transportation borrowing approved by the legislature and the State Bond Commission that still hasn’t been executed yet. 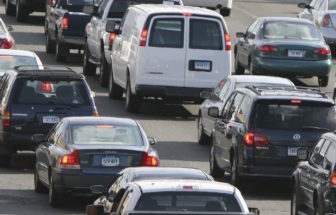 The chief reasons for Connecticut’s transportation bonding backlogs are a lack of staffing in the Department of Transportation and inadequate resources within the Special Transportation Fund to cover more debt service. The Malloy administration warned Wall Street credit rating agencies in November that the new state budget shortchanges the transportation program. Absent more funding, the program is headed for dramatic contraction over the next five years. 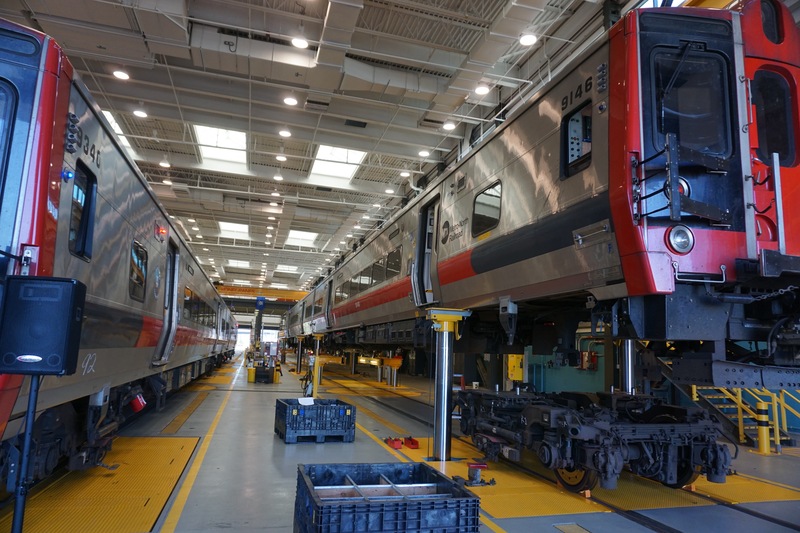 The alternative to all of these cutbacks, according to the administration, is a series of annual deficits in the transportation program starting with the fiscal year that begins July 1. The transportation fund would reach insolvency by mid-2020. On Jan. 10 the governor and Redeker outlined nearly 400 capital projects worth $4.3 billion that would be suspended over the next five years because of inadequate funding. Rail and bus fare hikes. Reductions in service on the Shoreline East rail line as well as the Danbury and Waterbury lines that feed into the MetroNorth rail commuter system. And likely cuts in Town Aid Road grants to cities and towns. Will election politics sink transportation debate? Traditionally, legislatures are reluctant to consider tax hikes and other revenue-raisers, such as tolls, during a state election year like 2018. But Malloy and others said there will be strong pressure to ignore election concerns. The governor made his announcement Wednesday surrounded by representatives of construction companies, labor trades, regional councils of government, a handful of legislators and other transportation advocates. “I think there’s a more complete coalition” pressing for a transportation investment than in past years, the governor said. And as more people become aware that Connecticut’s clogged transportation system is hindering job growth, particularly in the high-paying financial services sector in Fairfield County, support should only grow, the governor and others said. Rep. Tony Guerrera, D-Rocky Hill, one of the legislature’s most vocal advocates for electronic tolling and greater transportation investment, conceded that forcing a debate in the 2018 General Assembly session, which begins next Wednesday, won’t be easy. But House Speaker Joe Aresimowicz told Guerrera afterward that there would be a House vote on tolls in the 2018 session. The governor’s plan drew a quick endorsement Wednesday from Democratic gubernatorial candidate Ned Lamont, a Greenwich businessman. But two GOP gubernatorial contenders quickly came down in opposition. Danbury Mayor Mark Boughton vowed he would veto any toll legislation if it still lingered before the General Assembly next year. Malloy tried to make transportation the centerpiece of his second term in office. In February 2015, three months after winning re-election, the governor proposed a 30-year, $100 billion program to rebuild Connecticut’s transportation system. Gov. Dannel P. Malloy proposes his transportation initiative at the Capitol Wednesday morning. Behind him is Don Shubert, president of the Connecticut Construction Industries Association. But efforts to secure long-term funding bogged down. That’s because of both political opposition to tolls and fuel tax hikes as well as Malloy’s insistence that lawmakers first endorse a constitutional “lockbox” provision to ensure revenues dedicated for transportation are used solely for that purpose. That lockbox proposal has been endorsed by the legislature and will be considered by voters on the state ballot this November. Lawmakers agreed in the spring of 2015 to dedicate a portion of sales tax receipts to transportation. This was deemed the key to funding the first five years of the governor’s 30-year program, through 2020. Even though receipts from the state’s wholesale fuel tax also are projected to grow through 2022, surging debt costs would overwhelm that growth if Connecticut is to catch up on its deferred maintenance and other infrastructure investment. The governor is not the only Democrat at the Capitol this month to propose more funding for transportation. Rep. Jason Rojas, D-East Hartford, House chair of the Finance, Revenue and Bonding Committee, said he will propose adding 4 cents per gallon to the retail gasoline tax. And a coalition of House Democrats led Guerrera pledged this week to introduce legislation to establish electronic tolling. Republicans largely have been silent or resistant to increased funds for transportation coming into the 2018 General Assembly session. House Minority Leader Themis Klarides, R-Derby, said she is not philosophically for or against tolls. But establishing them in a geographically small state with numerous highway entrance and exit ramps could be a recipe for a fiscal mess.